Today, as the Danish musical world is well on the way to rediscovering the composer Asger Hamerik (1843-1923), it may seem a little strange that during his lifetime he was the best known Danish composer, after Niels W. Gade, outside the borders of Denmark. He travelled more and farther than any other Danish composer (including Gade) and was a member of a number of international juries in composition competitions. He was born Hammerich, but changed his surname to the less German-sounding Hamerik when he left Germany and went to France as a result of the outbreak of the Danish-German war in 1864. He had come to the world in Copenhagen on 8th April 1843. His father was a well known professor of theology in his day, and the family had in fact expected Asger to take a theology degree; but his musical talent was so obvious that he was allowed to study composition with both Niels W. Gade and J.P.E. Hartmann, who were both related to his mother. At sixteen he made his public debut as a composer with a song for tenor and piano, and the next year he wrote his first orchestral piece. During a stay in Norway in the summer of 1860 he then wrote his first symphony, in C minor, which was given the opus number 3. We have no knowledge of any performance of it, nor did Hamerik include it in the official numbering when he again began to write symphonies. The manuscript does not seem to have been preserved either. In 1862 Asger asked his father for permission to study abroad. Gade and Hartmann were both consulted before his father agreed. The tour went to London first, and then he settled down in Berlin, where he studied with Hans von Bülow. They remained lifelong friends, and Bülow would probably have exerted even more influence on the young Dane if political circumstances had not forced him to leave Germany. With him he had a letter of recommendation to Hector Berlioz, who accepted him as a composition student. Gradually they too established a friendship, and apart from a few short trips Hamerik remained in Paris until 1869, when Berlioz died. Berlioz helped him for example to organize a composition evening at the Salle Pleyel in May 1865, where there were performances of, among other works, Hamerik’s operaTovelille, opus 12, which he had already begun writing in Berlin. Among the works he wrote in Paris, the most grandiose is undoubtedly his Hymne à la Paix (1867), written for the World Exposition in Paris and performed under the composer’s own baton by a choir put together for the occasion with singers from a wide range of countries and a wind band, as well as no fewer than two organs and twelve harps. Hamerik had clearly learned from Berlioz’ mass effects, but since the score has been lost we cannot give any further assessment of the quality of his work. After Berlioz’ death came some years of travel, during which he wrote the one-act opera La Vendetta,which was premiered in Milan in 1870. The next year Hamerik was in Vienna, where he was visited by the American consul, who offered him the directorship of the conservatory and musical society in Baltimore, the Pea-body Institute. After taking advice from Bülow and others he accepted the offer and went in August 1871 to Baltimore, which became his home for the next 27 years. There he was given an orchestra which grew to 80 musicians (considerably more than Denmark’s biggest orchestra, the Royal Orchestra, could muster at the time). This meant that his composition work to some extent changed its focus and concentrated on orchestral music; at first a series of Nordic Suites, where some movements were based on Scandinavian songs and ballads. They were quite deliberately written to counterbalance the German-dominated repertoire that had been cultivated hitherto in the burgeoning music life of Baltimore. Hamerik spent the summer of 1878 in Denmark, which he had not seen since he went to the USA. In 1879 he began work on his first ‘official’ symphony, in F major, entitled Sym-phonie poétique. The following year the symphony was finished and was premiered with great success in Baltimore on 26th March 1881. Later the same year it was printed by the publisher Joh. André in Offenbach in Germany. André had been his publisher since about 1876. When published, the symphony bore a dedication to the Russian pianist and composer Anton Rubinstein, whom Hamerik had known since his studies with Bülow. This is a brief account of the genesis of the Symphonie Poétique – the version that can be read for example in Asger Hamerik’s own manu-script worklist. However, closer scrutiny of the preserved piano draft for the symphony permits us both to clarify and modify this account. It is evident, in the first place, that Hamerik conceived the work at the piano and only later orchestrated it, in contrast to his practice later, where we also have piano versions of some of the symphonies – but in these cases piano versions made after the event to promote the spread of the music. Secondly, we can see from the draft that Hamerik had originally intended to compose yet another Nordic Suite (it would have been number six in the sequence), but changed tack and thought symphonically instead. Both the first movement and the third movement (called ‘Romance’ in the composer’s draft score) were clearly titled as movements in a sixth Nordic Suite. The romance has the final date Baltimore, 27th December 1877; that is, before his stay in Denmark in 1878 and considerably before the time given for the beginning of the work in the worklist. By and large, the form of the symphony follows the established patterns of Vienna Classicism. In terms of key too Hamerik observes the conventions: the outside movements are both in the main key of the work, F major, while the second movement is in D minor and the slow movement in A major. The instrumentation is less massive than in the Nordic Suites, but Hamerik still has something to learn: here for example he gives the first violins the presentation of the themes in all four movements. He does not repeat this awkwardness, at least not consistently, in the second symphony, in C minor, theSymphonie tragique, with the opus number 32. The work was written in 1882-83 during his annual summer stay in the small fishing town of Chester on the Atlantic coast. It was published by André in 1883 and according to Hamerik’s own worklist was played for the first time in Baltimore in 1885 (on 18th April). As for the dedication, he aimed even higher this time: it was to Wagner’s patron, King Louis II of Bavaria. As in Beethoven’s famous Schicksal symphony in the same key, in Hamerik’s second symphony we experience a development from tragedy to triumph, from a gloomy C minor to a conquering C major. But whereas Beethoven’s triumph appears as early as the beginning of the finale, Hamerik keeps his hero for the concluding coda of the finale. And unlike Beethoven, but like his mentor Berlioz, Hamerik here uses a recurring theme – a short mourning strophe by the solo oboe – which is heard for the first time in the slow introduction to the first movement and appears again later in the same movement and once more in the finale just before the definitive shift from minor to major. Symphony No. 3, with the by-name Symphonie lyrique and the opus number 33, was written in the summers of 1883-84, but had its first performance in Baltimore on 16th March 1889. It was received with loud applause between the movements (at that time it was quite comme il faut to express one’s approval during the breaks in long works), and at the end the leader of the orchestra Adam Itzel Jr. presented the conducting composer with a gold ornament from the orchestra. From his mentor Berlioz Hamerik had learned to use a recurrent motif, a so-called idée fixe, and we find this technique applied in various ways in the two symphonies recorded here. In the Symphonie lyriquethere is a lamenting motif which is immediately stated by the strings in the introductory Largo section of the first movement. This permeates the whole slow introduction and returns in the fast section, now in the oboe, as a bridge between the exposition and the development, then again in the transition between recapitulation and coda. In the second move-ment, which in this symphony is the Scherzo, Hamerik places his idée fixe immediately before the recapitulation of the scherzo section, while in the third movement, a tripartite Andante in A minor, it is the bearing element of the whole middle section. Again it is the oboe which introduces it, and it is also allowed to interpunc-tuate the repeat of the first section of the movement. In the last movement, an Allegro con spirito, whose character slightly recalls Niels W. Gade, after an orches-tral culmination and a three-bar general pause, Hamerik brings in the recurrent theme as the element which gathers up the energy for the recapitulation. He puts it in the solo horn, which he otherwise rarely uses for melodically-borne solos, and thus brings his lyrical symphony to a con-vin-cing close. Johann André published the E major symphony in score and parts. On a special leaf after the title page we find the Norwegian-Swedish Royal Arms, and a dedication to Oscar II, who was King of Norway and Sweden from 1872. Symphony No. 4 was composed in the sum-mers of 1888-89 and had its first performance in Baltimore on 31st January 1891. It is dedicated to Christian IX, King of Denmark in 1863-1906, and certainly deserves its by-name Symphonie majestueuse. However it is unlikely to have been either the dedication or the by-name – but rather the outgoing character of the music – that made the symphony the most frequently performed of his symphonies during his lifetime in his native country. In this symphony Hamerik’s idée fixe is a short national-anthem-like major motif which, mainly in stepwise motion, only ranges over a third – in other words very basic thematic material which makes great demands on the composer’s imagination. In the first movement Hamerik makes the motif a basis for the slow introduction and then, as the main subject of the fast main section of the movement, chooses a rhythmically striking C minor triad figure in the strings. After the massive impression of the first movement, it is understandable that Hamerik felt a need for contrast. At any rate he chose to make the second movement an Adagio espressivo with a main theme which is presented by the solo flute. At the dynamic climax of the movement a unison trombone group sets in with a minor version of the recurrent motif. The third movement, a Scherzo, is also in a minor key and has a first subject which is derived from the unifying motif. In the fourth and last movement we are in a joyous C major with the motif as the first subject, playedmaestoso e solenne by the full orchestra, with rousing triplets in the brasses and timpani. The second subject is duly a contrast, a lyrical strophe borne by the first violins. Through a development section with the recurring motif in a minor version we arrive at the recapitulation and end with a coda where the motif is expanded into a particularly majestic version before the quick end of the symphony. The Fifth Symphony in G minor, which Hame-rik called Symphonie sérieuse, was written in the years 1889-91 and was performed in Baltimore under the composer’s own baton on 16th February 1895. Whether this was the premiere we cannot say for sure, for the work had been published by Breitkopf & Härtel in Leipzig in 1893. However, we know of no other performances elsewhere before the Baltimore one, where it shared the programme with music by Weber, Chopin and Liszt. In Symphonie sérieuse, right away in the slow introduction to the first movement, Hanerik presents hisidée fixe, which consists on the one hand of a motif of a minor third in a very simple rhythmic form and on the other of a chromatic afterphrase. The first subject in the quick part of the movement, which is in normal sonata form, builds further on the third-interval. The second movement is an Adagio in G major of almost Brucknerian magnificence, one of Hamerik’s best symphony movements ever. Its first subject is the minor third in the familiar rhythmic form, but now engrafted on a major-key context. The third movement is a very Beethovenish Scherzo in E flat major, where the third-motif hammered out in the trombones finally puts a clear stop to the gaiety. The fourth movement returns, as it should in a classically structured symphony, to the initial key of G minor. As its first element it has a slow introduction based on the third-motif and then, as the main theme of the fast section, it uses the whole idée fixe. 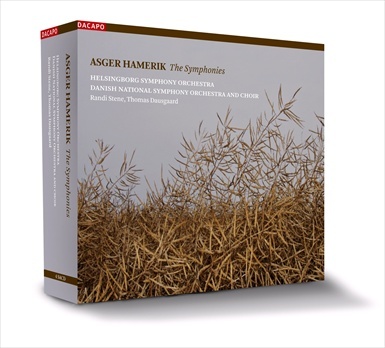 Symphonie sérieuse is not the longest of Hamerik’s six purely instrumental symphonies; this is No. 2,Symphonie tragique. All the same it was as the most important of those the conductor Launy Grøndahl selected Symphonie sérieuse to be played when Danmarks Radio was officially to mark the centenary of Hamerik’s birth in April 1943. Hamerik called the Sixth Symphony Sympho-nie spirituelle. It was written in 1895-96. The manuscript score, kept today at the Royal Library in Copenhagen, bears the end-date 25th March 1896. The work was intended for the concert marking the 25th anniversary of Hamerik’s appointment in Baltimore. But from the beginning of the 1895-96 season the regular symphonic concerts has been suspended for budgetary reasons, so Hamerik wrote the work for strings alone. It was the Peabody’s Alumni Association that undertook to organize the concert that was held on 5th May 1896 with an all-Hamerik pro–gramme. Besides the symphony the Nocturne from the opera La Vendetta(for mezzo-soprano, flute and strings) and the May Dance op. 28 (for female choir and small orchestra) were performed. Symphonie spirituelle is in G major and with its spirited outwardness quite lives up to its name. It was also the first Hamerik symphony to appear on record (recorded shortly after World War II by the Boyd Neel String Orchestra). The first movement is in regular sonata form where the development section reworks the second subject before the hymnic first subject. The subsequent scherzo movement (in G minor) has two trio sections which feature a beautiful, folksong-like theme. The thematic material from the actual scherzo section is re-used by Hamerik at a slower tempo and with a quite different character as the basis of a set of variations in the lyrical third movement (in E flat major). The fourth movement is again in sonata form and is based on its own thematic material, although at the actual beginning of the movement and again in the middle of its coda Hamerik quotes his first subject from the first movement. There is thus no question of a recurrentidée fixe in this work. There is however a clear cyclic feel, since both the outer movements and the middle ones are interrelated thematically. The symphony was published the year after its performance, again by Breitkopf & Härtel. The honeymoon went to Europe and ended in Copenhagen, where the family got to know its new member before the couple went back to Baltimore, where the Peabody Institute was to celebrate the centenary of the birth of its founder in 1895. As far as the music was concerned, the choice was made to have Hamerik premiere his opus 34, a Requiem which he had composed in the summers of 1886 and 1887 in Chester, and which his brother, Angul Hammerich, a music professor and critic had tried in vain to coax the Chorus of the Royal Opera in Copenhagen to premiere in its annual Easter concert in Copenhagen Cathedral. The Requiem therefore lay idle awaiting a suitable occasion, and this now came, with two magnificent concerts on 5th and 6th April. The choir had more than 300 singers, and the work was given more than 60 rehearsals. The contralto soloist, Julie Wynan, had been fetched from New York, and the success of the work was huge – The Baltimore Sun wrote that the music was “of overwhelming beauty”. Certainly Hamerik himself was not a Catholic, but he was a close friend of Cardinal Gibbons in Baltimore and is also known to have had discussions with a Catholic priest in Chester about the textual content and its meaning. As Berlioz had done a half-century before in his Requiem, Hamerik combined the first two parts of the Mass for the dead, the Requiem aeternam and the Kyrie eleison, into one movement where the quiet C minor prayer for eternal peace yields to C major wish for eternal light. The subsequent Dies irae quotes the first notes of the old Gregorian melody of the text about the Day of Wrath, just as Berlioz had done (in his Symphonie fantastique). In the Tuba mirum, Judgement Day is announced with ringing brass fanfares in andante maestoso, again like Berlioz. But unlike his mentor Hamerik creates a new continuity by making these fanfares a recurrent orchestral element in the Sanctus movement. The intervening Offertorio brings the contralto soloist to the fore, and she appears again in the concludingAgnus Dei, now also with the choir. The cyclic form of the text (it returns to the introductory section) is also reflected in the music, in the same way as we see in Mozart (or his ‘completer’, Süssmayr) and Berlioz. The first performance of the Requiem in Baltimore prompted very fine reactions from the press, and Hamerik was pleased with his collaboration with the director of the local Oratorio Society, Joseph Pache, who like himself had been a pupil of von Bülow. So he said yes when he was asked for a new work for choir and orchestra, for which he wrote the text together with his young wife at the end of 1897 and then composed in January-February 1898. But by then his time in Baltimore was running out. The board of trustees had decided not to hold regular symphonic concerts any more, and in February Hamerik reacted by handing in his notice to the end of the academic year. As early as 21st April 1898, just seven days before the first performance of the new choral symphony (which at that time bore the title Life, Death and Immortality) he suddenly left the city, followed a week later by his wife, who was pregnant. We do not know if she was present at the first performance in Baltimore’s brand new Music Hall (built with the Gewandhaus hall in Leipzig as its direct model), where the Oratorio Society and the Peabody Orchestra were conducted by Pache. In October their son Ebbe (the later composer) came to the world in Copenhagen, and then the family rested on the French Riviera. After this Hamerik was ready for a European tour, during which he presented his own works in Berlin, Vienna, Munich, Dresden, Leipzig, Paris and Milan, before settling down finally in Copenhagen in May 1900. There he composed very little in the course of the long evening of his life – he died at the age of 80 on 19th July 1923 – and lived more or less in retirement as far as Danish musical life was concerned. The Requiem remained Hamerik’s own favourite work, and he made sure he included the Offertorymovement in the above-mentioned presentation concerts, where it elicited positive comments from all sides: “Belle et émouvante” (beautiful and moving) said Le Figaro. “Eine echte Kirchen-musik” (a true work of sacred music) wrote Wiener Sonntagszeitung, although the concert in Vienna was held in the citadel of secular music, the Golden Hall of the Musikverein, where the reception after the concert glittered with celebrated names like the soprano Nellie Melba. And “classically weighty” was the judgement that could be read in the Danish newspaper Politiken, which had considered the tour important enough to send its reviewer Charles Kjerulf to Berlin. In the spring of 1908 Victor Bendix finally put the Requiem on the programme of the Danish concert society Dansk Koncertforening, but the work proved difficult to rehearse for the amateur choir and at first had to be performed in extracts. On the other hand the success of the complete performance in November the same year was so great that the work could be repeated at a Palæ concert on 13th December, now conducted by Hamerik himself. After this there was only one, not in fact very successful performance in Hamerik’s lifetime, in 1921. One might have imagined that someone on the Copenhagen concert scene would have got together a Requiem performance to mark Hamerik’s 75th birthday in 1918. But instead it was celebrated with theChoral Symphony, which he had in the meantime provided with a Danish text and revised, both textually and musically – twice in fact. Whereas in his first six symphonies Hamerik had respected the classical tradition by writing in four movements and with a definite key as the basis for the work, this time he composed in three movements and began in a sombre D minor, only to end in a jubilant C major. He still considered it natural to strengthen the unity of the music by letting thematic material recur from movement to movement, here primarily in the form of a hymn-like theme which we already hear in the slow introduction to the first movement, and which later comes to play a crucial role, not least in the final movement. It was the shaping of this theme in particular that was a core issue in Hamerik’s reworkings. A first revision was premiered under his own baton in Dansk Koncertforening on 1st December 1903, but since then the work had not been played in Denmark – but was played once more in Baltimore in 1907, although it is not quite clear whether this was the definitive version finished in 1906 and published the next year by Johann André. At all events it was the definitive 1906 revision that was used on 31st March 1918 in the birthday concert at the Casino establishment in Copenhagen, conducted by Kristian Ribers. The aging composer and his family sat in the box as guests of honour, and at the end of the concert he thanked the participants. According to Berlingske Tidende‘s reviewer (who signs himself A.T.), he said among other things that it was in that very hall at Casino that he had himself conducted the Choral Symphony back in 1868! It isn’t always the truth that gets printed!